Located on the northern coast of Malabar, Kasaragod, the headquarters of the district of the same name, comes lauded as a land of gods. Some twelve rivers including the Payaswini River flow in this northernmost district of Kerala. The quietness of the beaches found in district has the potential of captivating tourists. History weighs heavily on Kasaragod whose other claim to fame lies in its being home to the Bekal Fort, the best and largest fort in Kerala. Temples, mosques and churches are the other attractions here. Famous for its coir and handloom industries, the district is also known for the amazing art forms such as Yakshagana and Theyyam. Theyyam is the oldest ritualistic art form of India. Kasaragod serves as the most convenient base for exploring the various places of interest in the district including Bekal Fort and Valiyaparamba Backwaters. The famed Madhur Madanandeshwara Siddhi Vinayaka temple is the most famous shrine of Kasaragod. Located on the banks of the Madhuvahini River, the shrine is 7 km from the Kasaragod town and built in the traditional style of architecture. Thrikannad Thriambakeshwara temple and Mallikarjuna temple are other temples in the district. Built in the seventh century AD, Malik Deenar mosque in the Kasaragod district of Kerala is a built in a style unique to the state. It was built by Malik Deenar, a disciple of Prophet Mohammad, who had also constructed the mosques at Mangalore and Udupi in Karnataka. The mosque in Kasaragod contains the tomb of Malik Deenar. 10km south of Kasaragod, Bekal is home to some stunning beaches and spectacular fort. Waiting to be explored, the Bekal beach offers tourists an opportunity to have a charming date with unspoilt nature. 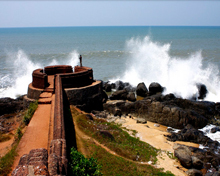 The seventeenth century majestic Bekal fort, facing the Arabian Sea, is the largest in Kerala. The fort came under the control of the Mysore ruler Hyder ali in 1763. It also served as a hideout of Tipu Sultan, son of Hyder Ali. Adjacent to the fort is the Anjaneya temple. Here you can also find a mosque. 6km north of Bekal fort, the secluded beach of Kappil captivates visitors who wish to unwind themselves at a place away from madding crowd. The Kodi cliff of the beach is a favoirite haut of the adventurous lovers. The town nearest to Bekal is Kanhangad which is eight km away. 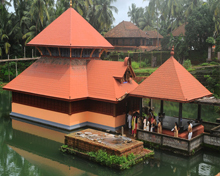 11 km north from Kasaragod is located Kumbla six km of which is located the only lake temple in Kerala - Ananthapura temple. This ninth-century shrine is the original abode of Anantapadmanabha, the presiding deity of the Sri Padmanabhaswamy Temple in the capital of Kerala, Thiruvananthapuram. 30 km away from Bekal and 46 km from Kasaragod is the famous backwater destination of Valiyaparmba. Abiundin with several islands, a boat cruise through the Valiyaparamba Backwaters will be a surreal experience. By Air: Bajpe Airport at Managalore in Karnataka is the nearest airport which is 45 km from Kasaragod. Kozhikode is another convenient airport which is 168 km away from Kasaragod. By Rail: Kasaragod railhead, on the Kozhikode-Mangalore-Mumbai railway route is connected by the major cities and places in India. By Road: Kasaragod is connected by motorable roads to different places and cites of India. While you can stay at Vivanta Taj, Lalit, Hotel Bekal Palace in Bekal, Kasaragod is home to large number of budget hotels. Thalathoor Heritage is 5 km from the Kasargod Railway Station. Gitanjali Heritage is another notable accommodation option when you happen to be in or around Kasargod. 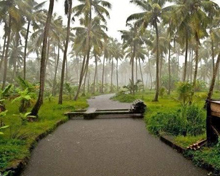 You can also stay in tharavadu (ancestral clan homes) houses.